You wouldn’t head down the road in your vehicle without having a tire pump available in the event of a flat tire, right? The best bike pump can get your tire pressure where it needs to be fast. Since there are so many types to choose from, we’ll help you narrow the options based on your type of bike, cycling needs, budget, and more. By Max Shumpert: This article has been updated to reflect the most accurate information regarding bike pumps available for those who are preparing for their next cycling trip. The best 5 available have changed, and information has been added to assist individuals in finding the best folding exercise bicycles currently available on the market. The FAQ has also been updated. 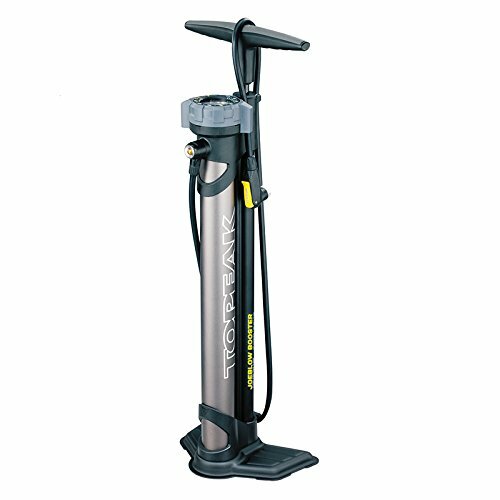 Floor pumps are helpful for those who want a bike pump for home use to store in their garage. Their more significant size and weight compared to other pumps make them non-portable, but they also fill tires more quickly, and can even inflate flat tires. The following pumps are our recommendations for best-rated bike pump that stand on the floor. This Topeak JoeBlow bike pump will set you back a little over $100, but it may be well worth the cost to you to know that you have a sturdy, quality pump that may last for years to come. Topeak created this pump with an aluminum cylinder and steel base, providing quality construction and a stable design that keeps the pump in place as you move air to your tire. The air chamber holds up to one liter of air at a time to ensure quick inflation with only a few pumps. You can inflate tires up to 160 PSI with this pump, so it’s a good choice for large bike tires or completely flat tires. One additional benefit to the JoeBlow bike pump is that it has both charge and inflate settings. The charge setting allows you to install tubeless tires with quick air flow that helps you get the right seal as you install. After you place your tire with the proper seal, you can switch to the inflate mode to add more air. It doesn’t matter if you have a Presta or Schrader valve on your bike tires because this pump will inflate both. Therefore, it may be a good choice if you have a family of riders who use different types of bikes, as this pump will work universally with them. 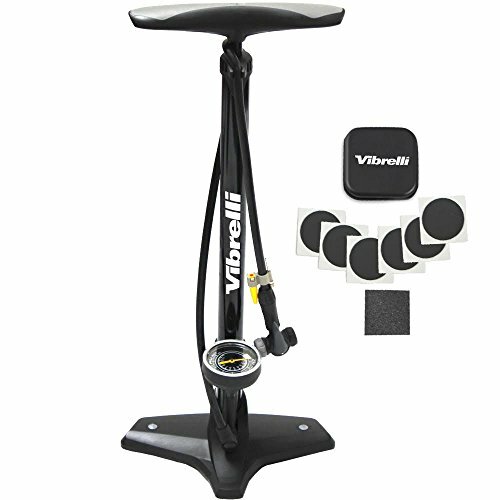 The Vibrelli bike pump is another excellent option for those looking for an at-home pump that provides plenty of air volume for flat or underinflated tires. This pump falls just under $50, making it a budget-friendly option for cyclists. With this pump, you can also inflate more than just bike tires. It comes with additional attachments for inflating sports balls and pool inflatables as well. With a maximum PSI output of 160, even most flat bike tires can inflate to capacity using the Vibrelli pump. The large pressure gauge is easy to read and goes up to 160 PSI for a precise reading. Cyclists will enjoy the Rapid T-Valve, which inflates tires quickly even when they need a lot of air. You can switch between Presta and Schrader options for the pump to work with either type of valve that’s on your bike tire. For peace of mind when you’re on the road, you’ll also receive an emergency puncture kit you’re your purchase of the Vibrelli bike pump. The puncture kit doesn't require glue but instead uses a patch to cover the puncture securely until you can get a replacement tire. This pump weighs only 2.5 lbs., making it easy to transport, if needed, but still made from quality materials to keep it stable as you pump. The Schwinn bike pump is the best value bike pump in this category, falling a little under $30. This pump has an extra broad base that keeps it stable as you pump, both for your safety and to prevent any damage to your bike during inflation. Your Schwinn pump will come with five different modes, making it one of the most versatile bike pumps around. You can inflate tires with Presta and Schrader valves, and it also will inflate those with Dunlop, a less common type of valve. Additionally, the needle and inflatable attachments will help you inflate sports balls and inflatable toys, like beach balls or pool floats. The Schwinn bike pump will inflate tires up to 140 PSI so that some flats may be out of the question. However, some customer reviews suggest that inflation up to 110 PSI is very easy with this pump, unlike others that become difficult to pump when they reach a higher PSI. You'll be able to neatly tuck away this pump in your garage, thanks to its design that keeps essential parts safe and the pump compact. The locking handle can push down and lock when you're done with it to keep the pump shorter. And the hose tucks into a slot on the front of the pump to keep it from getting damaged when it's not in use. If you’re looking for the best portable bike pump or the best compact bike pump to fit on your bike or in a backpack, these recommendations are for you. It’s a good idea to bring a pump with you for easy tire inflation while you ride to ensure that your tires have the proper pressure for your safety. 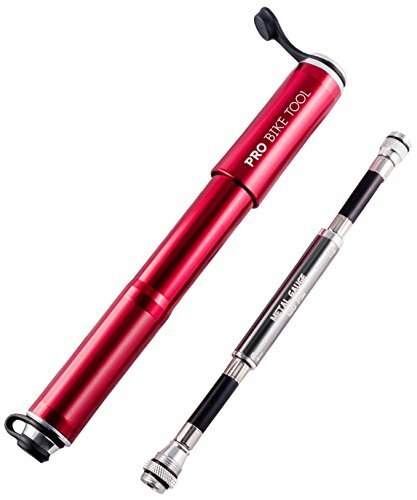 The Pro Bike Tool pump is one of the best portable bike pumps and best value bike pumps you can buy. Small enough to fit in your backpack for on-the-go inflation, this pump is also durable and fast for a mini pump. Although many small pumps can take a while to inflate a tire that's lost a lot of air, this pump's oversized piston lets you move air through the pump faster and with fewer strokes. And it will inflate your tires up to 120 PSI, which is helpful in cases where tires need a lot of air. You can carry this pump with you or attach it securely to your bike frame for convenience. It comes with a frame mount and Velcro strap to keep the pump in place, and you'll even have your choice of color – black, red, or titanium – to match your bike. With an aluminum alloy cylinder, the pump is lightweight, yet durable enough to withstand rocks and other things that may fly up during a bike ride. Gripping handles on the cylinder keep your hands in place for more comfortable and faster inflation. The pressure gauge on this mini pump is on the hose to save space. Large numbers give you an accurate reading of your PSI to avoid over or underinflating. The valve on this pump will work with either Presta or Schrader valves for a handy and universal tool. At just under $50, the Topeak Road Morph G Mini Pump is on the higher end of the scale for mini pumps, but it also provides reliability, durability, and some additional benefits that make it stand out from the crowd. This compact pump has a foldout foot piece that keeps it stable as it sits on the ground, so there's no need for you to kneel down and hold the pump with your hands as you inflate. Instead, you can use it as you would a floor pump. The T-shaped handle also makes the design similar to a floor pump, giving you a helpful grip and extra stability as you inflate your tires. The handle is even padded for your comfort. You can inflate tires with either a Presta or Schrader valve. The thumb lock on the valve keeps it in place over the valve stem, ensures an airtight seal, and aids in the proper placement of the valve. This pump will inflate tires up to 140 PSI. The aluminum cylinder is extra durable and made to withstand kicked-up particles or accidental drops. But, weighing in at less than a pound, this is one of the most lightweight pumps you’ll find, making it a convenient portable option. Over time, especially with consistent cycling, bicycle tires can lose some air, which can affect its speed and handling. You should keep your bike tires at your tire manufacturer's recommended pounds per square inch, or PSI, for optimal performance and your safety. A bicycle pump moves air fast through a hose to inflate the tires of a bicycle. Whether your tires lose air or become flat, a bike pump can inflate them so you can continue riding, even if you need enough air to make your way back to the car and get your flat tired repaired. There are several types of bike pumps within two main categories: hand pumps and electric pumps, which we’ll go in-depth with in a moment. Bicycle pumps have a few parts that you should become familiar with before you purchase one. If you don't know how to pump a bike tire, you should learn how a bike pump works so that you can ensure that you do it correctly. The valve. The valve of a bike pump is the piece that connects to your tire valve to allow air to transfer from the pump to your tire with an airtight seal to air doesn’t escape. Bike pumps come with either Schrader or Presta valves, which match their respective valves on the inner tube of your bike. You should check your tube’s type and ensure that your pump works with the correct valve. The cylinder. The cylinder refers to the long piece of the pump through which air moves. The piston. The piston is the metal piece that moves through the cylinder to create the movement of air. When you pull up on the handle, air moves into the cylinder. When you push down, the piston helps push the air down, through the hose, and into your bike’s tire. The hose. The hose connects the cylinder to your bike tube through the valve. Air travels through the hose and into your tire. Most hoses are only a foot or two in length because you typically don't need much range to inflate a bike tire. The pressure gauge. Most bike pumps include a pressure gauge to help you see the current PSI of your tire to ensure that you don’t under or overinflate it. Why Do You Need a Good Bike Pump? A bicycle pump should be one of the most reliable pieces of equipment you have on hand if you’re a cyclist. A pump should be to bicycle riders as a tire pump is to motorists. Under or overinflated tires can cause disruption to your bike's handling and speed, which could lead to unnecessary injury to you. When you have a reliable bike pump in tow, you can quickly inflate your tires on the go to allow your bike to ride smoothly on just about any terrain. When you have an overinflated bike tire, you risk your tires getting punctured more easily by small rocks, branches, and other obstacles on the road or trail. Underinflated tires tend to ride more slowly and won’t allow you to maneuver your bicycle as easily. A bike pump, especially one with a pressure gauge, can help you keep tabs on your tires’ pressure for a safe, smooth ride. 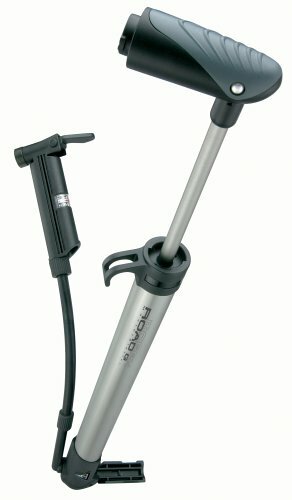 We mentioned that there are several types of bike pumps to choose from. As with most bicycle equipment, the best mountain bike pump or road bike pump for you depends on the kind of cycling you do, your bike's tires, and your desire for convenient, comfortable pumping. Also known as a track pump, a stand or floor pump is one of the best kinds you can choose for storing in your garage and inflating your bike tires before you head out for a ride. Track pumps have a steady base that allows them to sit on the floor without tipping. They also have a long cylinder that can move a significant amount of air through the pump at one time. Additionally, these types of pump usually have a more extended hose than others, which adds a bit of convenience for cyclists. A hand pump is a good option for cyclists who want to bring their pump on the go. These pumps are usually small enough to stash in a backpack or basket and offer convenience for inflating tires while you’re out on a ride. A mini pump and a hand pump are often considered the same thing, but there are mini pump varieties that are even smaller than typical hand pumps. These compact versions make some of the best portable bike pumps money can buy. One thing to consider, though, with mini pumps is that they often take longer to inflate your tire than other, larger pumps because of their smaller cylinders. Unlike a hand pump, a foot pump moves air through the cylinder by stepping on a pedal. These pumps are good choices for those with little hand strength or chronic hand pain from carpal tunnel syndrome or arthritis, for example. These pumps usually have a pressure gauge near the pedal so you can see your tire pressure as you pump air with your foot. CO2 inflators are one of the most expensive options for inflating your tire but can do the job quickly in case of an emergency. However, you should consider reserving this type of inflation device only when you have a flat tire. CO2 inflators offer a super-quick inflation, but some can be tricky to use. Some manufacturers make CO2 inflators with a shut-off valve to prevent you from overinflating your tire. Once inflated with CO2, your bike tire may last a couple of hours to get you to a safe spot for repair. Electric bike pumps are another option for cyclists. These are, by far, the simplest to use and can provide a quick inflation for your tire. Most electric bike pumps have technology that automates the pressure measuring process to do most of the work for you. However, you'll need a source of power to operate one of these pumps, so they're not the best portable bike pump option. Most electric pumps can work using a car's cigarette lighter for power. Now that you know about the essential parts of a bike pump and what types of pumps are available, how should learn how to pump a bike tire adequately using a pump. Of course, this process varies depending on the type of pump you choose to use. But, most manual bike pumps are similar in the way that they function to move air from outside the pump into your tire’s tube. First, you should figure out what type of valve your bike has: Presta or Schrader? If you aren’t sure, take your bike to a professional bike shop and choose a bike pump that works with that valve. Then, remove the valve stem cap and place the pump valve over your tube’s valve stem. Some pumps have a tab that you move up or down to ensure an airtight seal around the valve stem. Ensure that you move it to the correct position according to your pump’s instructions. Look on the side of your tire to find out its optimal PSI, or ask a professional at your local bike shop. Start pumping air using the handle or foot pedal, depending on your type of pump. You should hear air moving through the pump but not escaping the tire. Use the pressure gauge until you reach the optimal pressure for your tires. Move the tab on your valve, if you have one, to the opposite position and remove the valve from your tube’s valve stem. Replace the cap and enjoy your ride! The best-rated bike pump may not seem that important, but a quality, reliable pump can keep you moving safely during your rides. It's not common for cyclists to carry a spare tire with them on bike rides like it is for motorists to do so. That's why having a reliable pump is critical to ensure that your tires have optimal pressure on your longest rides. Even the best bike tires can fall victim to punctures or lost air, and it may happen when you least expect it. A bike pump is a smart investment for frequent riders to have a tool that can inflate a tire quickly and easily when needed. As with other bike equipment and helpful tools, you need to consider the type of pump that works best for your bike and needs. Most importantly, choosing a bike pump with the right valve can ensure that you don't damage your valve stem and tire tubes. You should consider your pump an investment, just as you would any other necessary equipment or tool related to your bike. A durable bicycle pump made from quality materials should last for years to come and provide you with reliability you can count on when you need to use it. Some manufacturers create pumps made mostly with plastic, whereas other pumps have more durable cylinders and handles made from metal or aluminum. The materials can also affect the performance of the pump, like its ability to move air quickly and the ease of pushing the handle or foot pedal. The PSI output of a bike pump refers to the maximum amount of air a pump can place in your tires. Your tires' suggested PSI can help you find out if a bike pump you are considering is the best option for your bike. If the PSI output is too low for your tire, your pump will not be able to inflate it fully. Some bike pumps have a PSI output of 100, which may not be enough for tires requiring a higher PSI. Others have higher thresholds of 200 or more. Typically, the smaller the pump, the slower the air moves through the pump. Smaller cylinders can’t hold as much air volume as larger cylinders, which means that it will take more time for you to fill up your tires. If you want the best small bike pump, it's a good idea to look for one with the highest air volume to ensure a rapid inflation even when you're on the go. As mentioned, Presta and Schrader are two different types of valves that your bike may have. Your bike needs a compatible pump that works with its valve to properly inflate your tire. Presta valves are typically longer and thinner than Schrader valves. Schrader valves are most common to find on bikes in general, but if you have an athletic racing bike, you may have a Presta valve. It’s a good idea to read reviews before you purchase a bike pump because they may give you an idea of others’ experience with the gauge accuracy. Pumps with pressure gauges can be incredibly helpful to avoid underinflating or overinflating a tire, but only if they provide an accurate reading. Look for comments on a pump’s gauge accuracy to determine if the gauge is one you can trust before you purchase. How large and heavy is the pump you are considering? Portability is an important factor for many cyclists because the ability to take a pump with you while you ride is a benefit. However, if you're just looking for a pump to store in your garage for home use, its weight and size may not be as significant. You should check a pump's length and weight, which manufacturers usually list on the package or in product descriptions, before purchasing it to determine if it meets your needs. Is the bicycle pump you are considering easy to use? Does it take a lot of strength to push it with your hands or foot? Is it easy to place the valve on your tire’s valve stem and inflate your tire quickly? These are critical questions you should consider before purchasing a bike pump because they relate to the pump’s overall ease of use. You don’t want to struggle to use your pump, especially if you need to inflate a tire in a hurry. Size and weight. Mini bike pumps have a much smaller cylinder, and usually, a shorter hose, than floor bike pumps. They're also lightweight and small enough to fit into a backpack. Portability. Mini bike pumps are perfect for portable use since they can fit easily into a small bag to take with you as you ride. Some even attach to the frame of your bike. Floor bike pumps are not as portable because of their larger size and heavier weight, so most people use them at home. Air volume. Floor pumps can hold more air at a time than a mini pump, which helps inflate your tires quicker. PSI output. Floor pumps tend to have a higher PSI output than mini pumps, meaning that that may be able to inflate your tire entirely from a flat tire. The lower PSI output of mini pumps makes them suitable for topping off a tire that needs a little air. Taking care of your bike pump is crucial if you want to make it last for years to come. Lubricate the piston inside the cylinder by adding a few drops of chain lube to the cylinder every two to three months. This keeps the washer surrounding the piston lubricated for natural movement inside the cylinder. At the same time, you can spray some lubricant on the rod that comes up from the cylinder when you move the handle to prevent it from sticking. Push the handle up and down a few times to work the lubricant through. Periodically inspect the valve, hose, and other parts to ensure that nothing is cracked, bent, or rusted. If you find anything out of place and don’t feel comfortable replacing it yourself, take the pump to a bike shop for help. Your bike pump is an essential tool for your bike maintenance routine and emergency kit. The right pump can keep you and your bike safe from underinflated tires, which can cause improper handling, and overinflated tires, which can make it easier for objects to puncture your tires. Floor pumps and mini pumps are among the most common types of bike pumps. Our recommendations can meet the needs of your Presta or Schrader valve bike to get your tires inflated quickly, at home or on the go, for the utmost safety on every ride.